Eileen Marie (Heim) Vedra died peacefully on February 5, 2019. She was born to the late George and Esther (Hoes) Heim on September 28, 1930 in Escanaba, Michigan. She was blessed with 88 years on earth before returning to her home in Heaven. 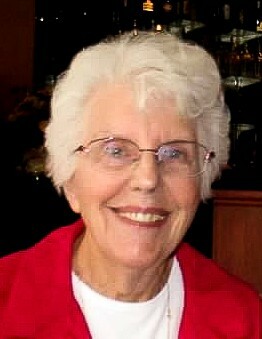 Eileen was a devoted daughter, wife, mother, sister, grandmother, great-grandmother, aunt, friend and neighbor. She graduated from Our Lady of Lourdes Catholic High School in Marinette, Wisconsin in 1948. She married Francis Vedra on July 10, 1954. Together they had two daughters and were married for just 17 years before Frank’s passing. Eileen worked for Fox Valley Technical College and Lakeland College. She was an active member of St. Margaret Mary Parish in Neenah, where she volunteered in the parish office and attended weekly Bible studies. Eileen will be remembered for her kind and gentle nature, her strong spirit and deep faith. She will be deeply missed by her daughters: Mary (Ron) Moriearty, Sheboygan Falls, Anne (Jim) Pankratz, Madison; brother , Bob (Barbara) Heim; sisters: Pat Hnilicka and Barbara Firme; six grandchildren: Sean (Erin) Moriearty , Patrick Moriearty, Erin Moriearty, Ben Pankratz, Elena Pankratz and Sydney Pankratz; two great-grandchildren: Evelyn and Sam Moriearty; and many other family members and friends. Eileen was preceded in death by her husband, Frank, her parents, George and Esther, as well as other members of her extended family. Mass of Christian Burial will be held at 11:00 a.m. on Tuesday, February 12, 2019, at St. Margaret Mary Parish, 620 Division Street, Neenah, with Fr. Dennis Bergsbaken officiating. Visitation will be at the church on Tuesday from 9:00 a.m. until the 11:00 a.m. time of mass. Interment will be in Forest Home Cemetery, Marinette. Memorials may be made to St. Margaret Mary Parish or ThedaCare Hospice Foundation. The family would like to thank the staff at ThedaCare Cardiovascular Care and Cherry Meadows Hospice and her past and present neighbors, friends and church family for their friendship and support.